Since 2015, a growing community of artists, scientists, philosophers and writers is building The Parliament of Things. Inspired by the work of Bruno Latour they raised a public platform and started a speculative research in which human and not human actors and actants can meet to discuss each other’s interests and positions. Can we envisage a politics beyond humans? Can we speak on behalf of things? Can we speak as things? And: does this make sense? What can this approach add to our political institutes and the processes of public opinion? 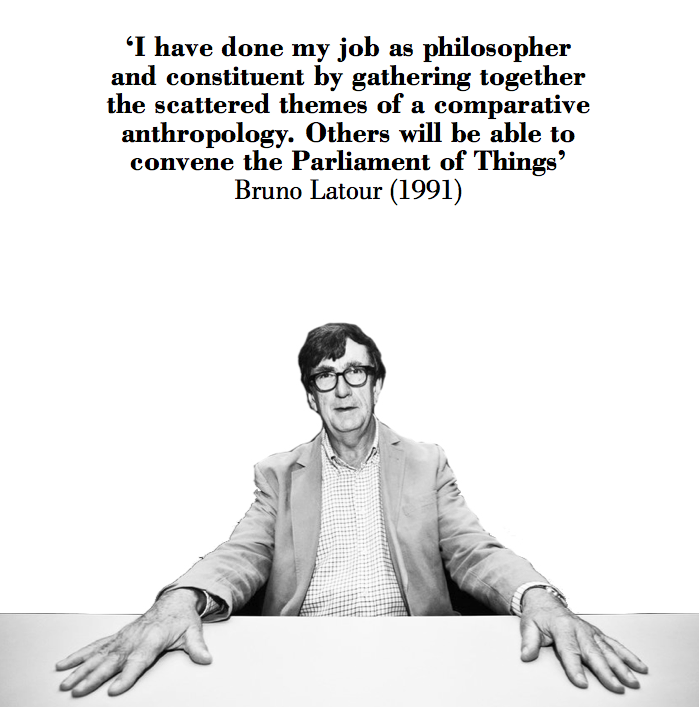 On the occasion of Bruno Latour’s visit to Amsterdam and prior to Latour’s presentation of his new book Facing Gaia Building Conversation and The Parliament of Things hosts a special Assembly. During this assembly, the Parliament of Things, we investigate what it means for us to speak on behalf of things, on behalf of nature. Will this remain a dualistic relation between people and things, or is it conceivable that a different relation will unfold, that we will give ourselves a different place in the universe?